A B-52 Stratofortress, B-1 Lancer and B-2 Spirit fly over Guam after launching from Andersen Air Force Base, Guam, for an integrated bomber operation Aug.17. This mission marked the first time in history that all three of Air Force Global Strike Command’s strategic bomber aircraft simultaneously conducted integrated operations in the U.S. Pacific Command area of operations. As of Aug. 15, the B-1 will be temporarily deployed to Guam in support of PACOM’s continuous bomber presence mission. 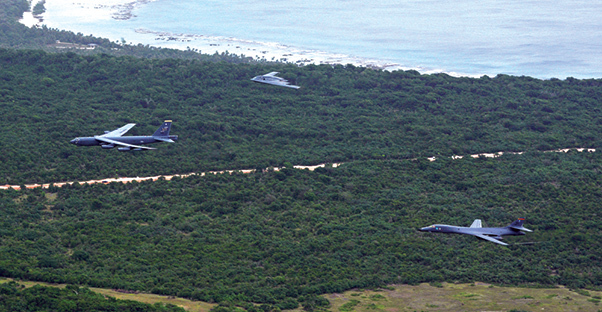 ANDERSEN AIR FORCE BASE, Guam — History was made Aug. 17 when all three of Air Force Global Strike Command’s strategic power projection bombers, the B-52 Stratofortress, B-1B Lancer and B-2 Spirit, simultaneously took to the sky during their first integrated bomber operation in the Indo-Asia-Pacific region. Though all the aircraft have deployed independently to the U.S. Pacific Command’s area of responsibility in the past, this was the first time all three bombers flew a formation pass over Andersen Air Force Base, dispersed and then simultaneously conducted operations in the South China Sea and Northeast Asia. “This mission demonstrated the U.S. commitment to supporting global security and our ability to launch a credible strategic defense force,” said Brig. Gen. Douglas Cox, the 36th Wing commander. Missions such as this provide opportunities for bomber crews to integrate and train with allies and partners in a variety of missions and are also designed to strengthen capabilities by familiarizing aircrews with Andersen’s geographic area of operations. Several B-1s and more than 300 Airmen from Ellsworth AFB, South Dakota, arrived at Andersen AFB in early August to replace the B-52s assigned to Minot AFB, North Dakota. 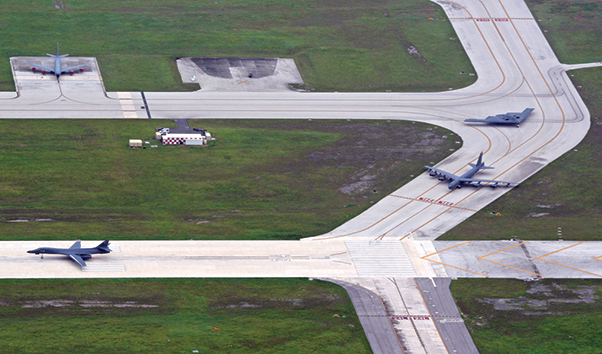 Effective Aug. 15, the B-1s are temporarily located at Guam to carry out PACOM’s continuous bomber presence mission. Capt. Kaitlin Tardieu and 1st Lt. Ruben Labrador, both 69th Expeditionary Bomb Squadron B-52 pilots deployed from Minot AFB, said after a successful mission, they will be heading home once the changeover is complete. “We’ve been out here the past six months flying Pacific power projection sorties, so all over the Pacific area of responsibility doing assurance deterrence missions,” Tardieu said. With a large weapon capacity and exceptional standoff strike capability, the B-1 provides PACOM and its regional allies and partners with a credible, strategic power projection platform. A B-52 Stratofortress, B-1 Lancer and B-2 Spirit taxi in preparation for an integrated bomber mission at Andersen Air Force Base, Guam, Aug.17. This mission marked the first time in history that all three of Air Force Global Strike Command’s strategic bomber aircraft simultaneously conducted integrated operations in the U.S. Pacific Command area of operations. As of Aug. 15, the B-1 will be temporarily deployed to Guam in support of PACOM’s continuous bomber presence mission. Additionally, as a demonstration to U.S. commitment to the region, three B-2s also arrived in theater Aug. 9 from Whiteman AFB, Missouri, to conduct local sorties and regional training and integrate with partner nations. During the deployment, members of the 509th Bomb Wing will hone skills in such key areas as command and control, air refueling and long-range navigation, while directly interacting with allied military forces. The CBP mission and global strategic bomber deployments are part of a long-standing history of maintaining a consistent bomber presence in the Indo-Asia-Pacific region in order to maintain stability and provide assurance to U.S. allies and partners in the region. PACOM’s area of responsibility covers 52 percent of the globe, which makes strategic bombers an effective long-range global attack capability to assure allies and deter potential adversaries. AFGSC continues to routinely deploy bombers to Andersen AFB, which provides opportunities for Airmen to advance and strengthen regional alliances and the long-standing military-to-military partnerships throughout the Indo-Asia-Pacific.